Believe it or not, Instagram is one of the easiest social media platforms to build a following for a beauty blog. Instagram is a very visual platform and beautiful images reign supreme. Thus, beauty bloggers have the advantage, as much of what they do requires inherently beautiful images. And honestly, it isn’t that difficult to build a loyal following on Instagram. With over 700 million active monthly users worldwide, there’s plenty of potential to build a massive following if you know what you’re doing. I want to share with you some tips on how to become a beauty blogger on Instagram. 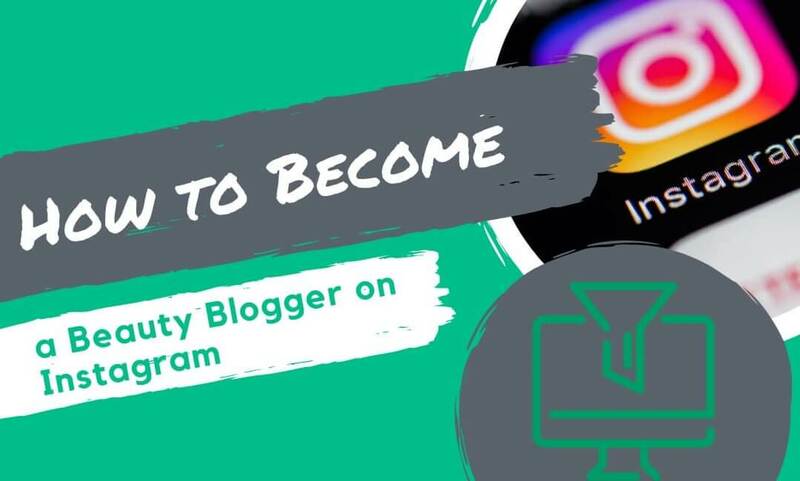 Before we truly break down what it takes to become a successful beauty blogger on Instagram here’s a quick disclaimer: professional Instagramers treat their accounts like jobs. That means they’re posting every single day, making new connections, and engaging with their audience. If you’re serious about building a loyal following, you’ll have to be committed for the long haul. Okay, let’s get started. That’s right; you only get one link. Instagram isn’t like Facebook or Twitter. You can’t simply post a link to a beauty product and call it a day. You’re allowed a single link in your biography, and that’s it. Use it wisely. In most cases, you’ll want that link to point directly to the homepage of your blog, but you may want your followers to visit an affiliate page or something else like a YouTube channel. Whatever the case, be strategic with how you use your link. Beauty blogging is an art style, but instead of using an easel or canvas you’re likely using images from a smartphone. Some of the most successful Instagram beauty bloggers take hundreds of pictures a day. They take pictures while driving, while taking the kids to school, and even sneaking a few at work. So the next time you’re drinking an iced coffee at Starbucks while rocking a new shade of lipstick you’d like to show off to your followers you should consider snapping a few pics and posting it to your account. It’s rather simple to find your audience on Instagram. Simply find another beauty blogger who has way more followers than you do and begin following their followers. For a beginning beauty blogger, this will grow your page by leaps and bounds. The philosophy behind this approach is that a portion of the people you follow will feel obligated to follow you back. Plus, you already know that these people are interested in your niche, or why would they be following another beauty blogger in the first place? This brings me to my next point. I’m sure that there are thousands of beauty bloggers with thriving Instagram accounts out there, so how do you stand out from the crowd? You’ll need to study the competition. Analyze what they’re doing, how often they post, what kind of content they’re posting, etc. After you’ve performed your research try to find a way to differentiate yourself. There’s nothing wrong with copying something that works. If you notice that all of the big beauty bloggers get thousands of likes, comments, and reposts when they post pictures of themselves wearing maroon lipstick while doing a pirouette on the side of a mountain then perhaps doing something similar might be a good idea (no matter how crazy that may seem). There’s no shame in that, but you also want to stand out from the crowd. Ask yourself these questions: what can you do that’s different from everybody else? What can you do that’s unique to only you? Consistency is key. Growing a healthy Instagram following doesn’t happen overnight. In fact, it may take you several years to ever reach 100,000 followers (a goal that many Instagramers aspire to). Imagine how long it’ll take you to reach 1,000,000 followers. Try to stay positive when you have days where you have little to no growth. In fact, there may be days where you’ll have more people unfollowing you then actually following you, but that’s okay. It happens. It’s not uncommon for large Instagram accounts to lose hundreds of followers a day. Stay positive. Running an Instagram is just like running a successful blog; you’re going to have to stick with it for a while before you start seeing success. It’s easy to get side tracked and post a cute picture of your baby cousin for your audience to “oh” and “ah” over, but don’t mistake your beauty Instagram account for your personal account. Your followers aren’t there to look at family pictures. They are there for beauty related posts. Sure, it’s okay if you deviate every once in a while to show off a baby picture or two. This will allow you to connect with your followers on a more personal level but never lose focus. You’re running a beauty blog, not a personal page. Always keep that in mind. So, you’ve followed a ton of people from another beauty bloggers Instagram page, and a portion of them have followed you back. Now what? You can simply ignore them and post on a regular basis and hope they engage with your posts. That can work, but it’s better if you actually interacted with your newly acquired audience. It doesn’t take much effort to throw out a comment here and there. “What a lovely shade of blush that is”. “Oh, nice! Kim Kardashian wore something similar at the music awards last night! Rock it, girl!” Don’t be surprised when the audience you begin to engage with reciprocates and starts engaging with your content. As more and more people like and comment on your posts, this will prompt the lurkers (individuals who simply lurk on a page but never engage with its content) to engage as well. The most important piece of advice I can give you is to simply get started. If you’re genuinely wondering how to become a beauty blogger on Instagram you just need to create your account and get your first post out there. Once you start building momentum, the only thing that can stop you is you. Remember, high-quality pictures are key, stay consistent, and follow the best practices outlined in this article. If you do all of that, plus keep up to date with any new updates Instagram is likely to throw at us in the future, you’ll exponentially increase the chances of both your blog and Instagram account being successful.